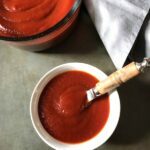 This is a really EASY Homemade Ketchup with only 5 Ingredients and honey instead of sugar, so it’s more natural and – I am not kidding you – tastes amazing! 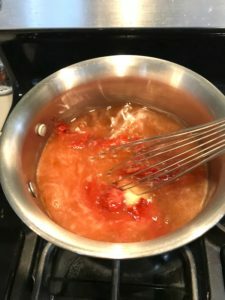 The thought of making my own ketchup used to be completely fleeting…sure it sounded great, but seriously, I’m a busy woman and have no time to make condiments that I can buy at the store. 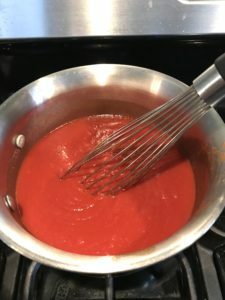 I also didn’t believe that I could make something that tasted like my childhood friend, Heinz. 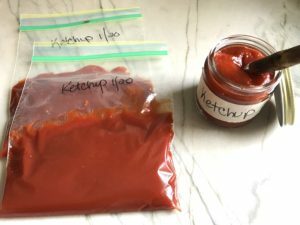 However, I am a homemade ketchup converter! 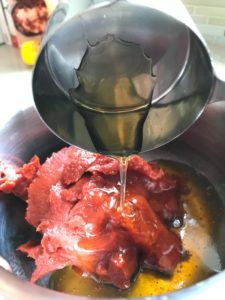 Not only does it take literally MINUTES to make, but it tastes even better than the stuff from the store-bought bottle!! It is also is so delicious in my 5-Ingredient Meatloaf recipe! 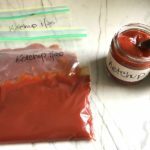 If you have never made your own ketchup, TRY IT! It takes only minutes to prepare!! 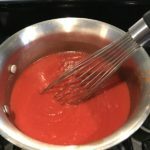 It starts with two 6 oz cans of Tomato Paste. Then add honey, distilled white vinegar, garlic powder, onion, powder, salt, and water…that’s it! 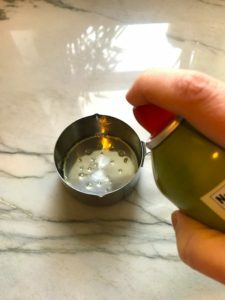 TIP: For the to honey, to make measuring and pouring it out of the cup super easy (ie it doesn’t all stick to the cup) I like to spray the measuring cup or spoon with coconut oil or olive oil spray. 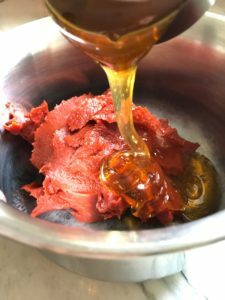 See how the honey just pours out so easily and doesn’t stick! Such a great time and hassle saver! 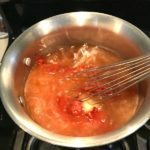 Simply combine all ingredients in a medium saucepan, whisk together, and simmer for 20 minutes partially covered so that the splatter doesn’t get all over your kitchen. 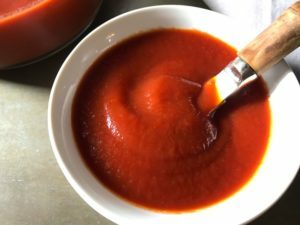 After the ketchup has simmered for 20 minutes, taste for salt and add to taste. Let cool and transfer to storage containers and/or freezer bags. We actually do not use that much ketchup, so I store a small jar in the fridge that can last 3-4 weeks. I store the rest separated into freezer bags with 1 cup each and then label it with name and date. 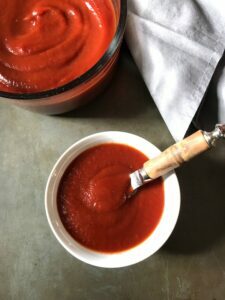 This is an easy 5-ingredient ketchup recipe that uses Honey as a natural sugar so you can feel good about giving this to your family! Bring to a boil, reduce heat, cover mostly with a small opening for steam to escape. Simmer 15-20 minutes. Cool and store in the fridge and/or freezer. Enjoy! TIP: To make measuring and pouring the honey out of the cup super easy, i.e. it doesn't all stick to the cup, I like to spray the measuring cup or spoon with coconut oil or olive oil spray.